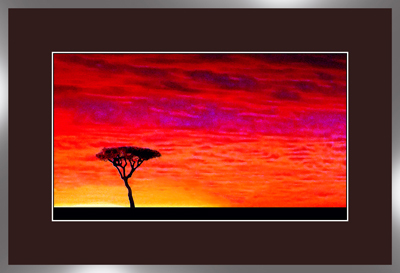 I wanted to capture the amazing colours, vibrance and the complexity of a subject I had only ever seen in photographs, but without producing a 'typical African landscape' with animals, forests, and the usual subject matter that a more traditional view would generally have included. I didn't want anything to distract the viewer from the main subject which was the sky, and the effort I was going to give to it, in order to make it the stunning experience it obviously is. The solitary tree in silhouette is the counterpoint, and immediately focuses the viewers attention and becomes the starting point of a journey of visual exploration of the colours, textures and layers I have put into this picture. as a baseline or horizon from which the whole perspective of the sunset is anchored. the result overlaid with some digital processing to enhance the layering, texture and colour vibrancy. The tree and foreground have also been rendered to slightly exaggerate sharpness, and to remove any hint of foreground detail. The result is this stunning giclee limited edition. The picture was planned, constructed, layered and generally built up over a period of a few weeks, and I sincerely hope you like the result.